Let frisky dragonflies illuminate your yard with this Silver Mesh Dragonfly Party String Light. Silver mesh dragonflies give these ten string lights party flair, making them great as an entertainment piece or funky accent. Add a little fun to your indoor or outdoor spaces with this set of ten string lights featuring little silver mesh dragonflies. Perfect for entertaining or as an eye-catching accent in bedrooms and more, these lights add personality and cheer. Includes four spare bulbs and green wire. 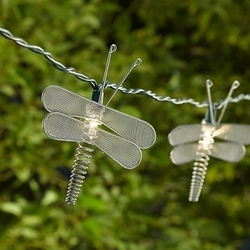 • Silver mesh dragonfly string lights. • Includes ten 12v .08A clear incandescent bulbs. • Includes 4 spare bulbs and 1 fuse. • Includes 30" of green lead wire. • 12" of spacing between lights.